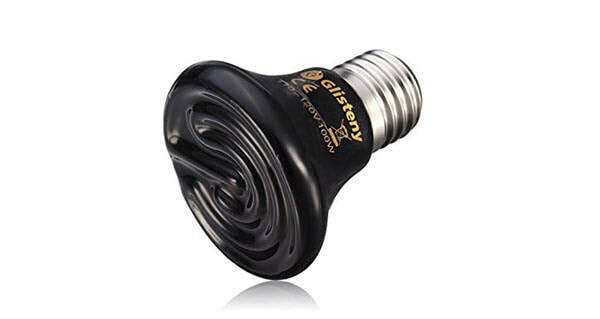 ​Product: Ceramic Heat, GLISTENY Mini Brooder Bulb Infrared Bulb Emitter Lamp Infrared Ceramic Bulb Heat Lamp, 25w. 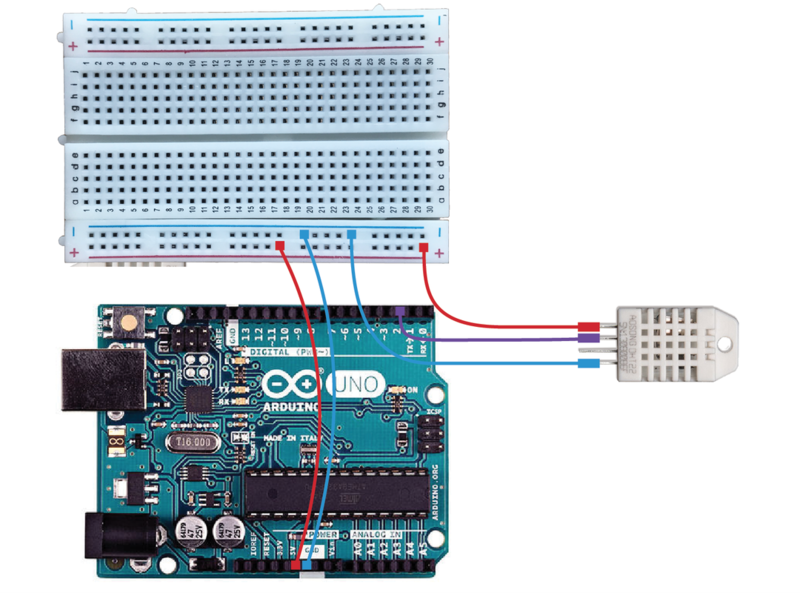 • Arduino Uno and breadboard on acrylic plate by manufacturer. 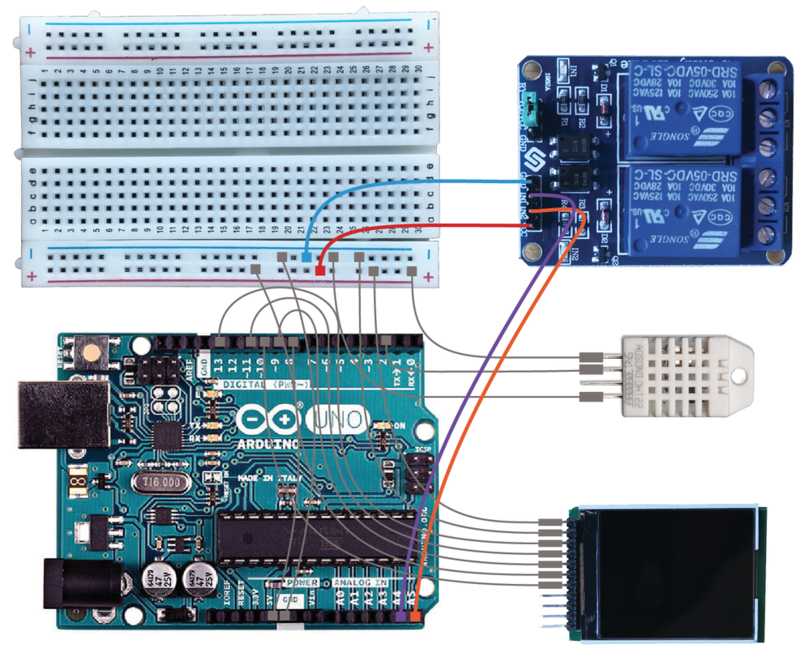 This project uses the open-source Arduino prototyping platform. 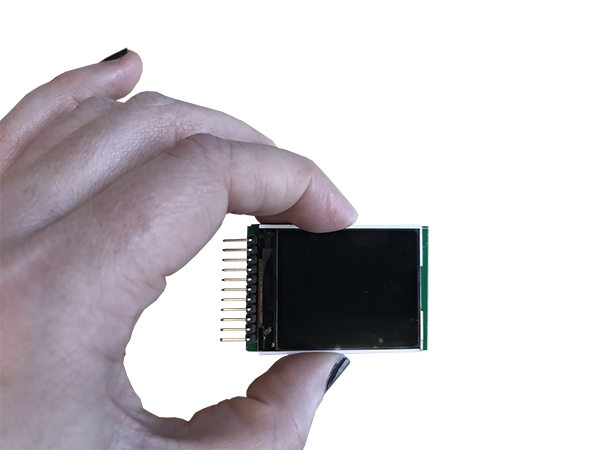 The Uno utilizes Atmel’s low-power 8-bit microcontroller and Arduino IDE, the Integrated Development Environment for programming, which runs on all major operating systems. 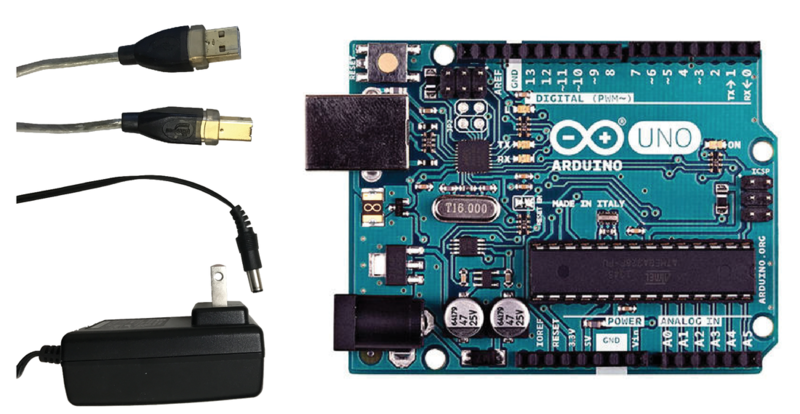 Arduino also has a large following of online users that share code and libraries. Cables Required: USB 2.0 Cable A/B, and AC-to-DC adapter with a 2.1mm center-positive plug. 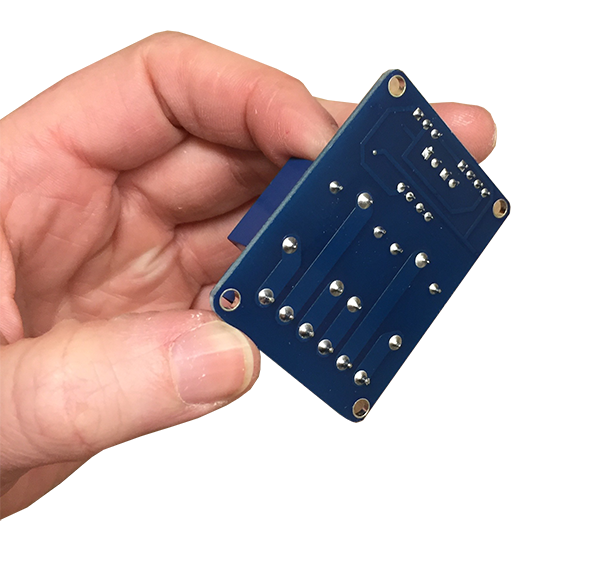 Breadboards are a fundamental part of solderless circuit design, and are helpful when prototyping new ideas. The power rails flank the sides (running north-south) while the terminal strips (data) run east-west. The left image shows the breadboard casing while the right image shows the embedded circuitry. For this exercise, we’ll only use the left side of the board to complete the circuit. 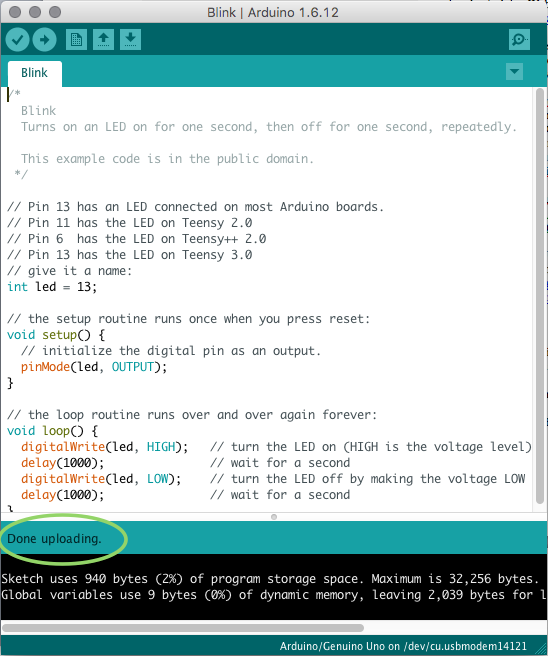 Download and install the Arduino Desktop IDE for your operating system (or you can code online using the Arduino Web Editor). Tools > Port > /dev/cu.usbmodemXXXX (the 4-5 numbers at the end are custom to the device). Before proceeding with the setup, make sure the board is properly set up uploading one of the example sketches included with the software, such as Blink. File > Examples > 01.Basics > Blink. Once the screen says “Done uploading” the orange LED should blink every few seconds. • Pin 3 (null) – ignore this pin. 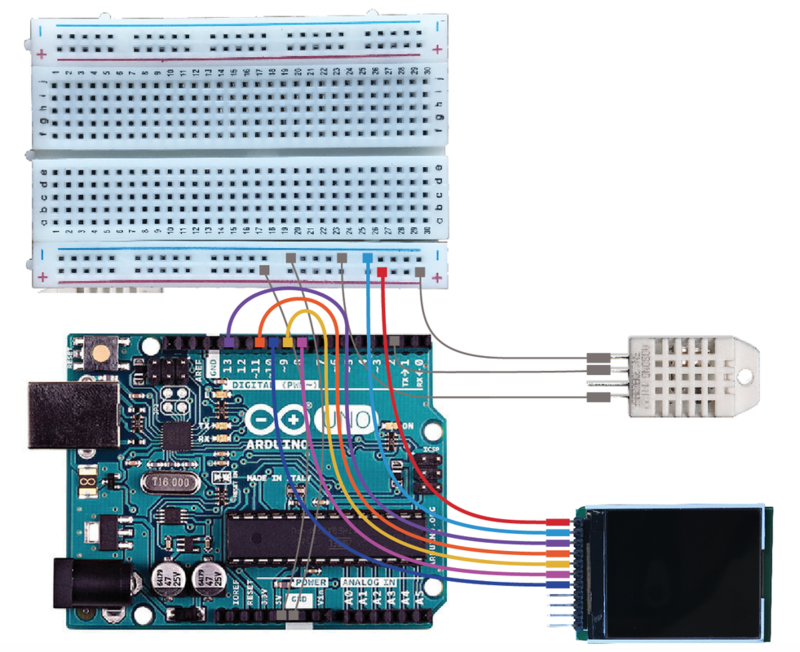 Repeat the steps for the second sensor, connecting pin-2 to Arduino port 4. 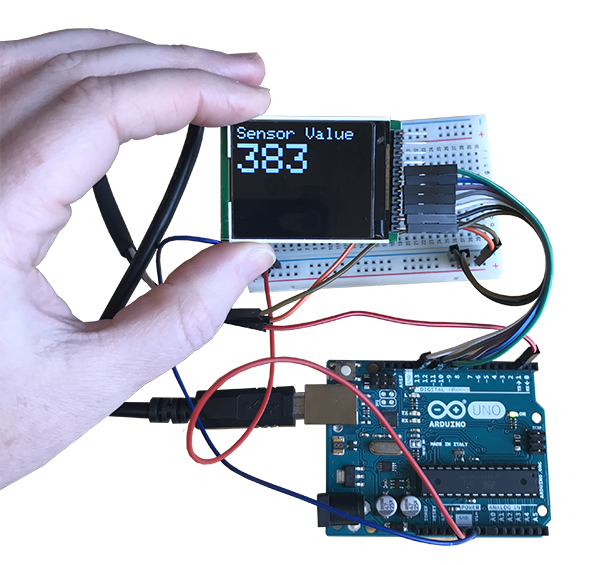 Download and install the DHT22 libraries from adafruit. Follow the instructions and make sure they are located in the correct folder. 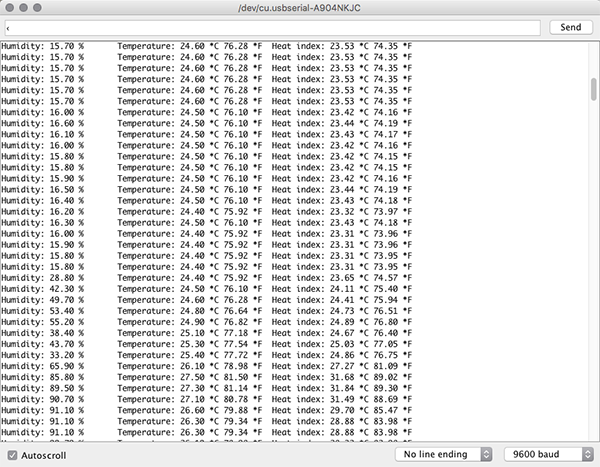 Open the serial monitor to see readings (Tools > serial monitor). ​There may be a 2-second delay. Electrical tape should only be used for short term use. Wrap the wires with shrink wrap and use a heat gun to shrink the covering. Once the cables have been extended, test it again to make sure everything still works. There should not be any changes to the code. Product: SainSmart 1.8 ST7735R TFT LCD Module with MicroSD LED Backlight. 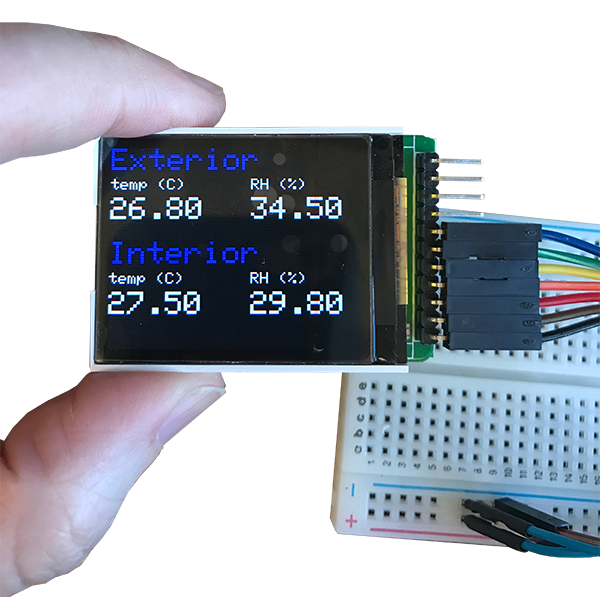 The screen is full color and easy to program using Processing-type controls. The back of the device reveals the pin labels and uses. Connections (from top to bottom, confirm with notations on back). The screen thinks it’s reading a sensor plugged into pin A0, which we do not have, so just use this sketch to make sure the screen is properly connected. 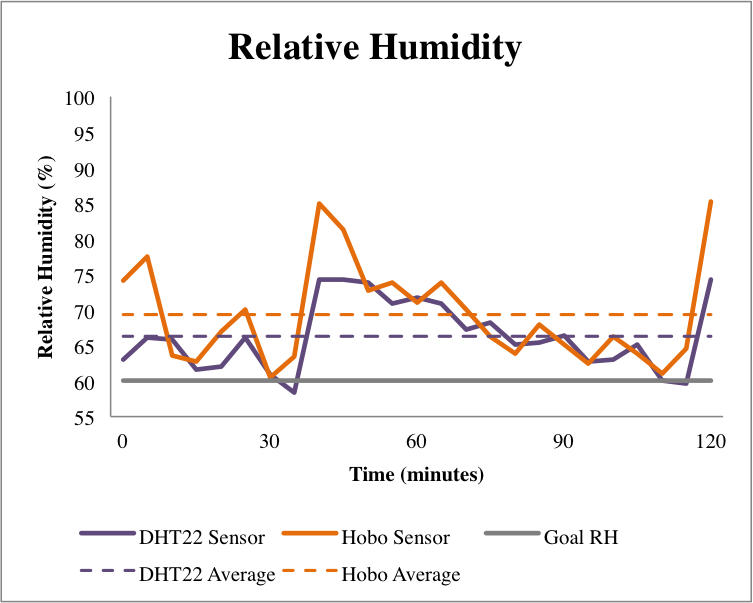 The screen provides a temperature (C) and relative humidity (RH %) reading for each sensor. 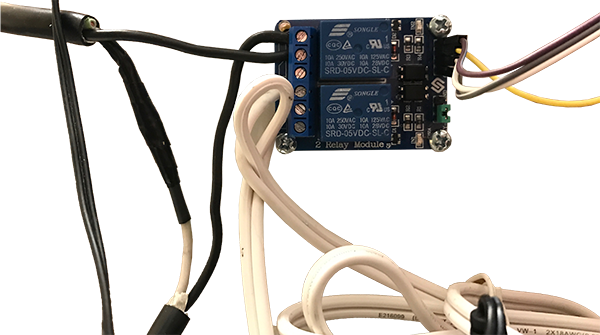 This device is used to control power supply to appliances and equipment with line voltages. It switches the power from high (on) to low (off), essentially connecting or disrupting current from the power source. This device works with line voltages, so make sure all wires are disconnected from power source before proceeding. 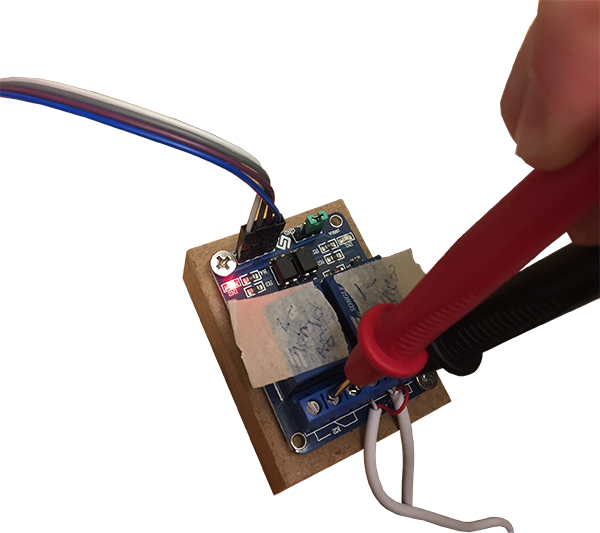 The back of the board also poses an electrocution risk, so it is helpful to attach the relay to a piece of non-conductive scrap material (such as wood or MDF) before proceeding. The device will be re-housed in a later stage in the process. The relay has 4 pins, GND, IN1 (input1), IN2 (input 2), VCC. Without plugging any of the devices into the input ports, it is possible to test basic operation and functionality. This is also helpful to better understand the controls. The IN2 LED should blink and click every few seconds. 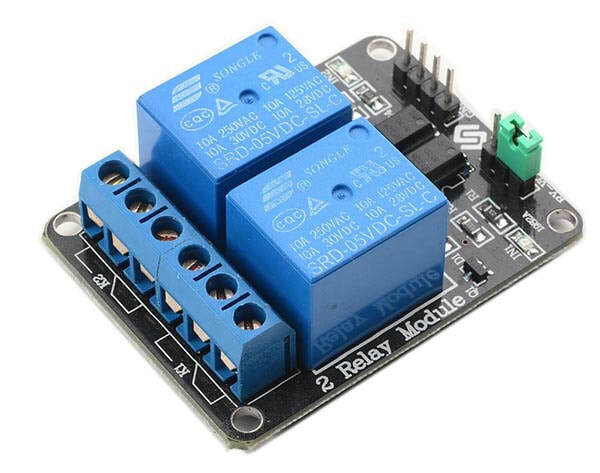 Change “RELAY2” to “RELAY1” to test the other input. 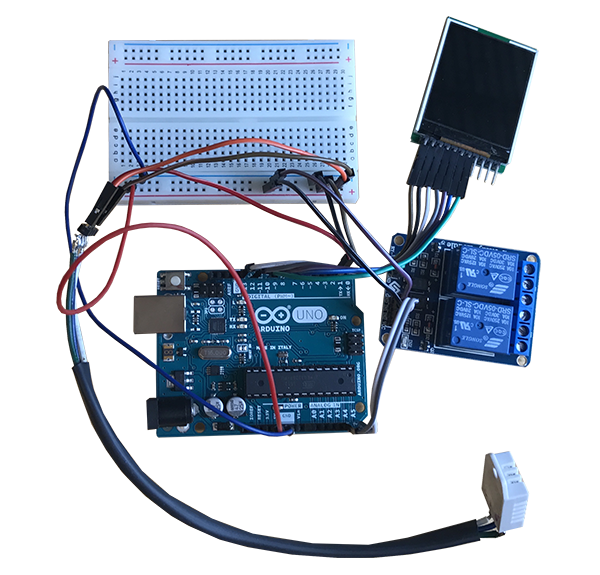 While the code is still running, use a microcontroller to test the power supply to the device. When the IN2 LED is illuminated, for example, there should be power circulating between all three input pins on the K2 side. When the LED is off, there will not be power between the second and third input. Now that all of the devices are connected and running, it’s time to connect the external appliances. 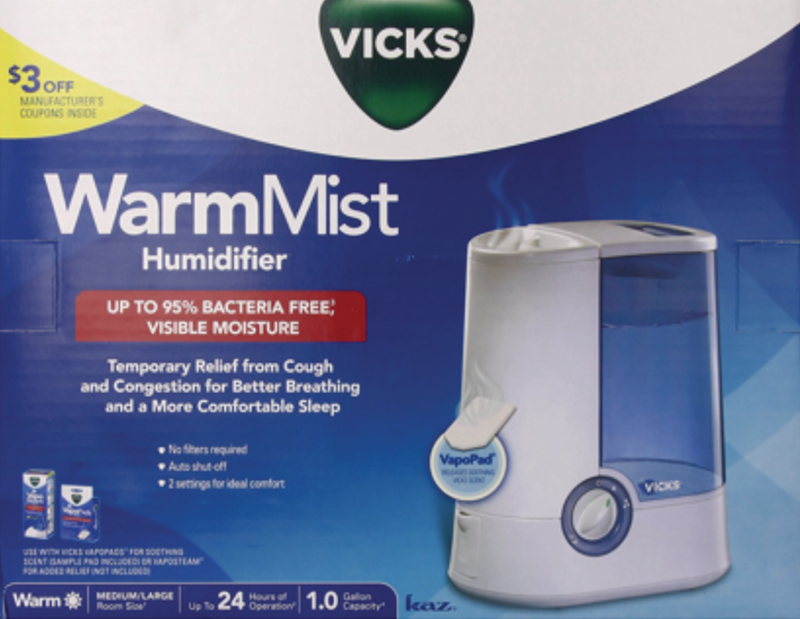 Product: Vicks V745 warm mist humidifier. This device is a commercially available household humidifier. I actually used a 2-year old product and bought a new one for my own use. Note: when the humidifier is hooked up to the box, it needs to sit lower than the opening so the steam can rise. One of the wires needs to remain intact, while the other gets cut, stripped, and stuffed into the relay. Conventional power cords have two types of wire – one is grooved or ribbed and the other is smooth. 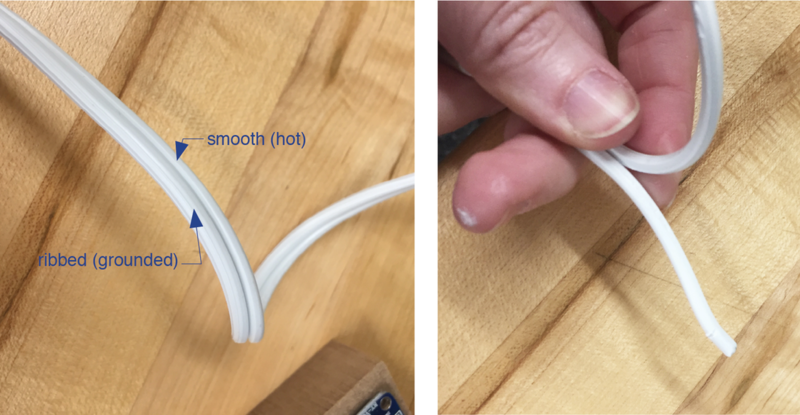 The grooved wire is grounded (neutral) while the smooth wire is ungrounded (hot). Cut the smooth (hot) wire to connect to the relay. Note: other wires (such as USB power supplies) have both wires within one casing – to reveal these wires, cut through the casing lightly with a knife in order to preserve both wires inside. Insert one end of the split wire into the middle K1 input ports. Insert the other end into the port directly left of the first wire. You will repeat this step for the heater. Since there is no straight-forward sample code for this step, test the device once the heater has also been installed. Do not plug either device into a power supply yet. The system was originally designed with a radiant mug warmer as the heat supply, which eventually was changed to a heat lamp to provide more heat. The mug warmer took two hours to change the ambient heat of the box from 22C to 26C while the heat lamp took only one hour to increase the ambient heat by 20C. Since both options use radiant heat, they not only heat slowly, but they maintain high temperatures even after the power is disconnected. If the desire is to move quickly between hot and cold ambient temperatures in the chamber, a supplemental cooling device may need to be installed. Because the lamp is in a moist environment, it needs to be protected with a weatherproof socket. The lampholder comes with two 6” leads (black and white) with the free ends stripped ¾”. Use a spare extension cord or the cord from an old appliance. You’ll need to cut about 16” from the end that includes the prongs. I used an extension cord with three prongs. Carefully remove the rubber jacket and internal paper to expose the three wires (black, white, green). 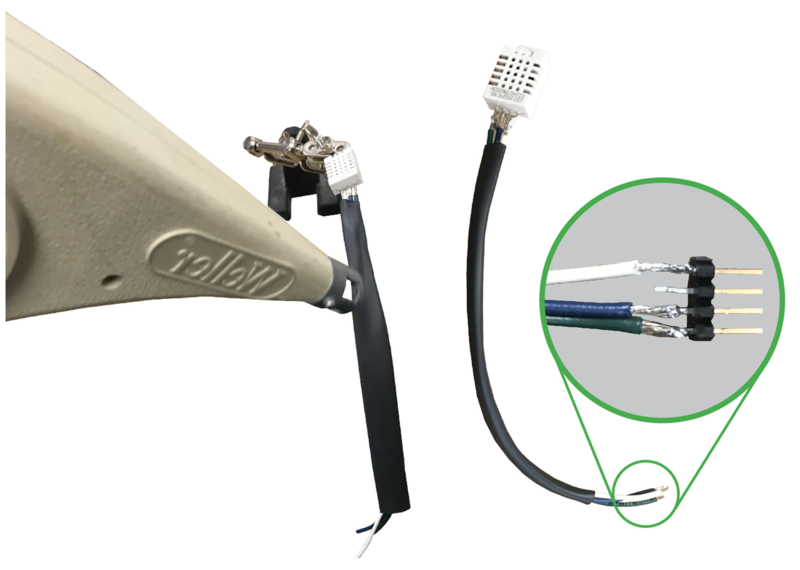 Since the lampholder only has black and white wires, cut the green wire (it can live within the rubber jacket). Using leftover wire from the cut extension cord, extend the length of the wire if necessary. I added 12” of length. 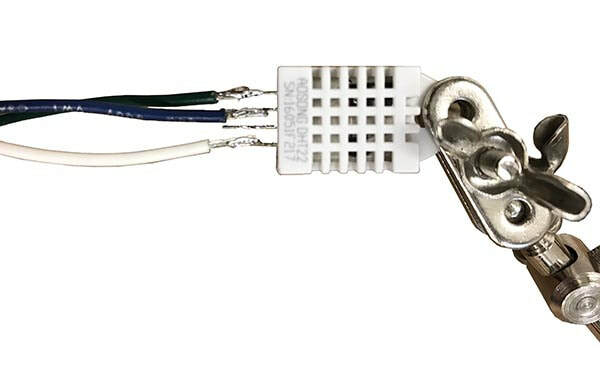 This is a fairly simply connection – connect the black to black wire and the white to white wire. If using a 3-prong cord, you can disregard the green wire from the extension cord. Strip the ends of the wires about 3/8” and intertwine with the connecting wire. 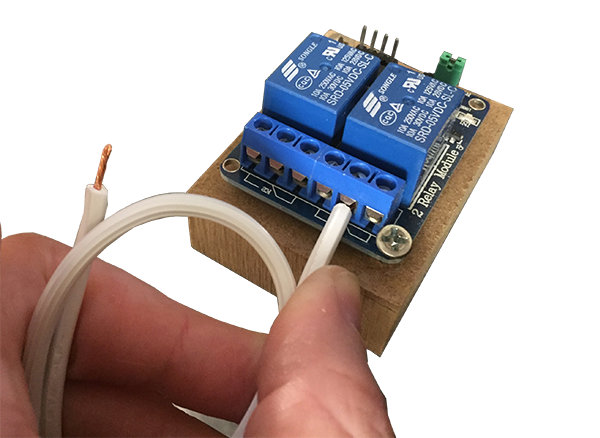 Since current has trouble flowing along sharp corners, it is helpful to fill this connection with solder to ensure a clean path for current. 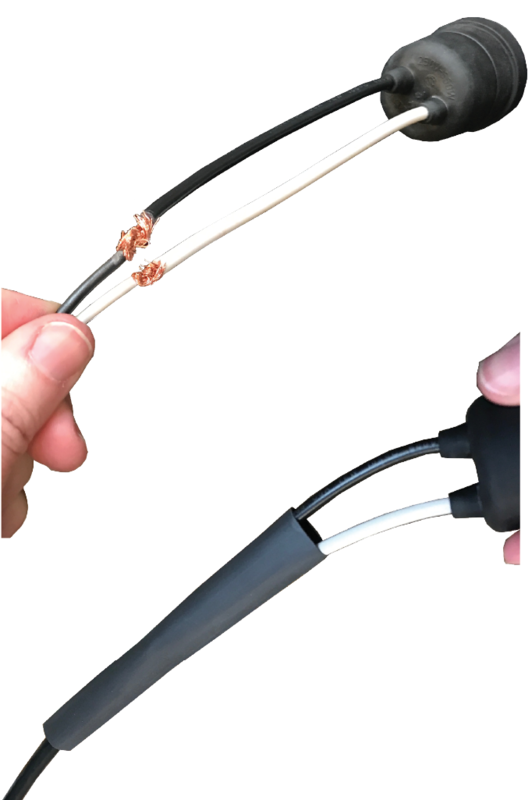 Cover any electrical current with heat shrink tubing. Be sure to thread wires through openings in box and 3d printed holder case (which will be discussed later) before finalizing wire connections. 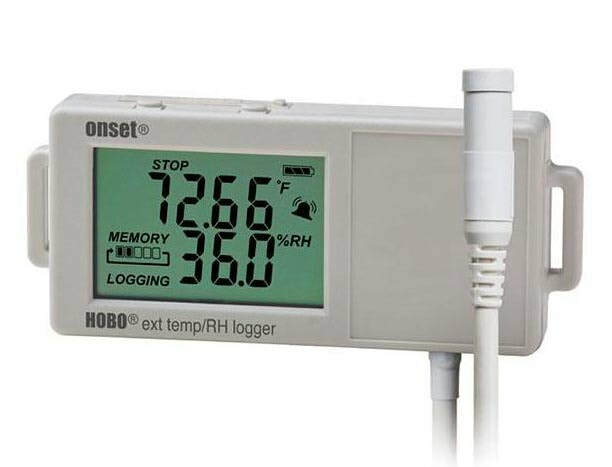 Once the devices are connected, run the sample relay code (from above) again - it may be helpful to use a longer interval so the devices have some time to heat up. The appliances will need to be plugged into a power source for this to work. Due to the high humidity and temperature conditions, the manufacturer recommended the version with the probe to protect the equipment (as opposed to using an all-in-one” device). This also provides the added benefit of avoiding the free-heat from the alternative unit, which would be more noticeable in such a small volume. One device is required for each chamber. 4-circuit device is used to measure the surface temperatures at both sides of the specimen as well as an additional probe for ambient conditions in the room. Exterior unit not required, but it did provide for easy mounting and interchangeable environmental sensors. 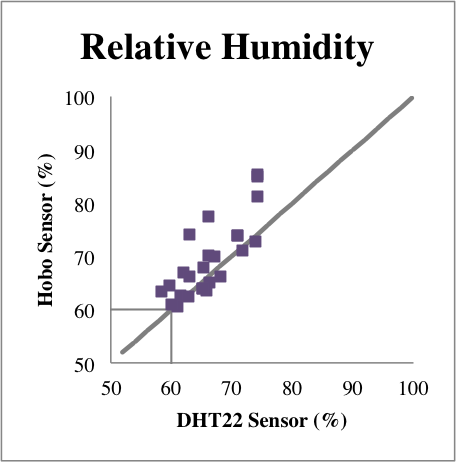 There are two different sensors in each chamber (a) DHT22 and (b) Onset Hobo. 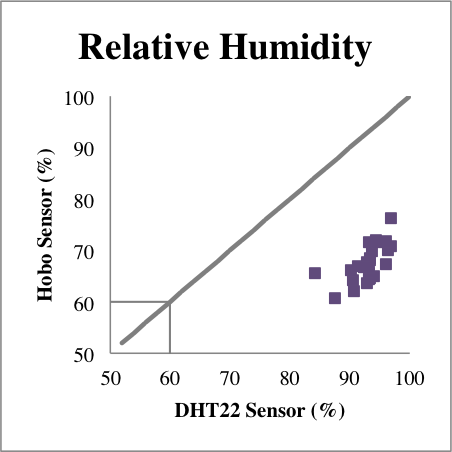 The DHT22 sensor is connected to the Arduino, so it controls the heater and humidifier. It does not record any of the readings. 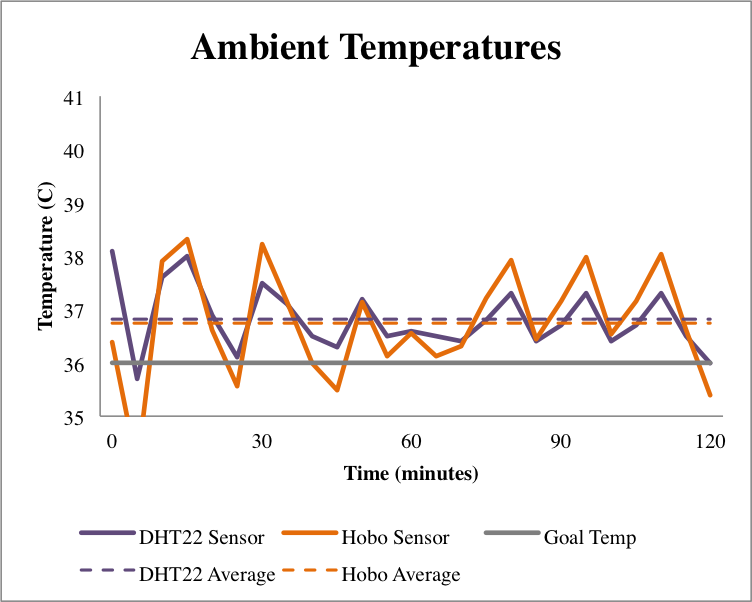 Meanwhile, the Hobo sensor provides the actual data readings. 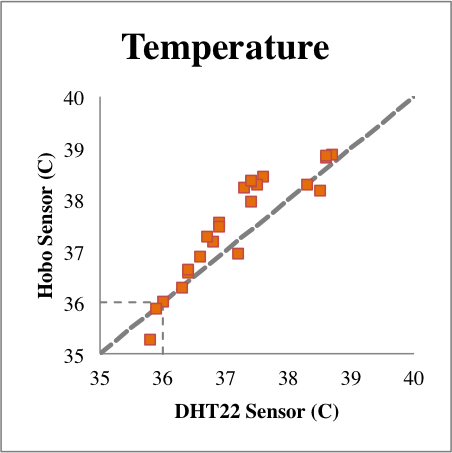 It is likely that the DHT22 sensor is not as precise as the Hobo sensor, so the two will need to be calibrated. ​Both of the following two-hour test use a 2” piece of XPS foam to seal the hot box. The goal temperature was 36°C and the goal RH was 60%. Readings from each sensor are taken every five minutes. 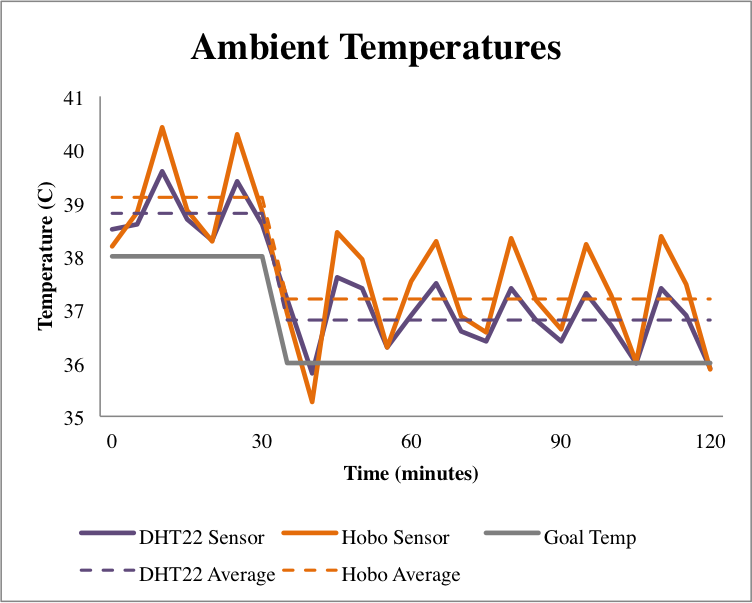 The graphs on the left show the readings over time while the scatterplots on the right show the readings plotted against each other, so if the sensors were both reading the same value, the points would fall on the center line. 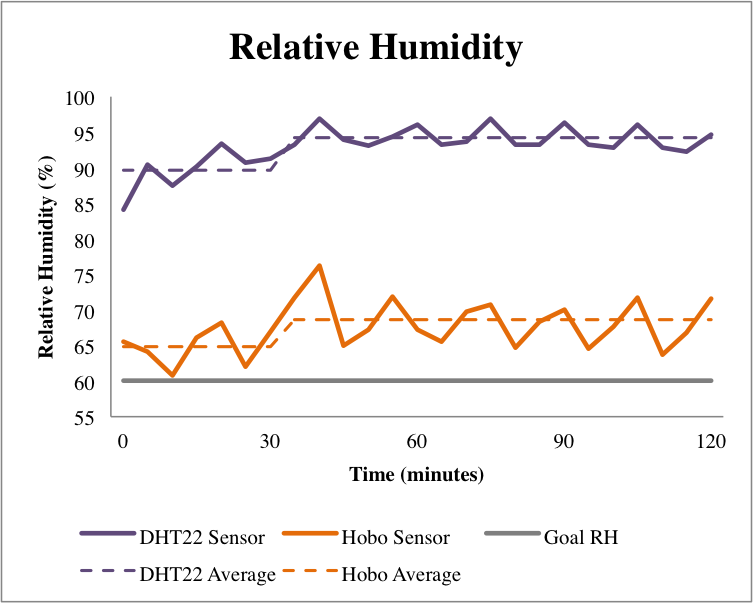 While the ambient temperature readings were relatively close (within 1°C), there was a significant difference (22.58%) between relative humidity values, so the code was adjusted as follows to fix this difference. 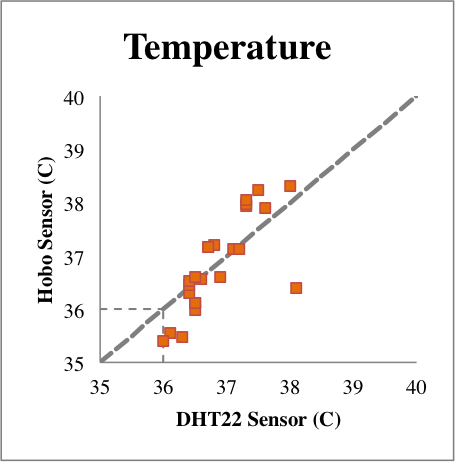 The post-calibration test, shown in figures 37-40, shows that the revised code worked to provide much more accurate readings.